Oh, how much time we waste! We live in an anesthetized society, one not recognizing the truth that we are all called to live in the will of God. We go about like people in a stupor. Yet we are called to walk in the footsteps of the saints gone before us, the ones who came out of their societal denial and used their allotment of time for God. Ours is not an easy task. There is no more time to walk with one foot in the world and one in the will of God. We must decide. We must walk in the footsteps of those who, in their own times, were not popular. Oh, saints are popular enough now, when we read about them in biographies, when we gaze upon statues of them in the churches blessed to still have such things. But the truth is, few were popular in their own times. Why? Largely because they reminded the world that what we GET out of life is not what really matters. I ask myself: how much of this thinking have I, myself, bought into? What is the motivation behind what I do with my moments and hours? If I knew God were coming for me tomorrow, what would I do today? Have I been on the fence, perhaps not fully given over to the world ... but not altogether ready to abandon myself to God? 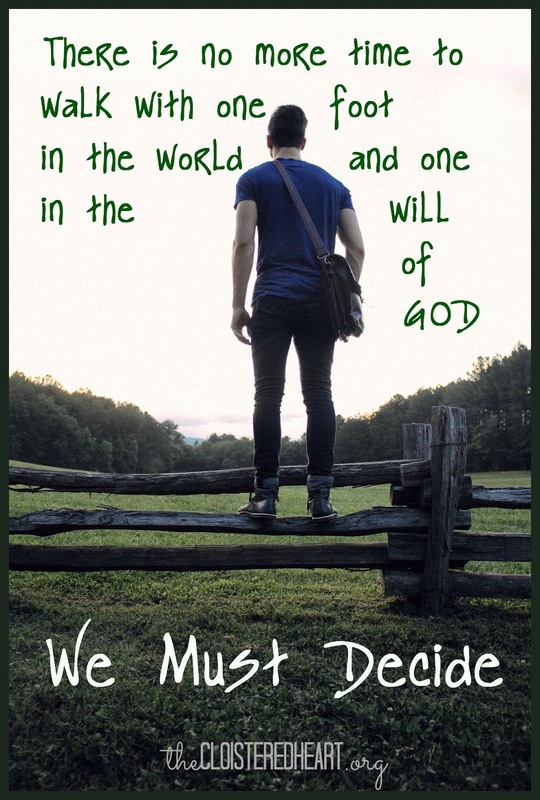 I cannot walk with one foot in the world and one foot in God's will. I must decide.